1000L Rebottled Non-UN approved IBC on plastic pallet. 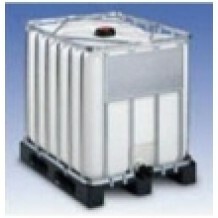 Suitable for non-hazardous filling goods only. Supplied with NEW virgin bottle & valve fitted in quality used cage. Cost saving option when you need a brand new IBC. The cage is reconditioned but has an entirely new bottle inside. Your product will only come in contact with the brand new container. Suitable for all non-hazardous liquids. Electronic pressure leak tested & approved for food & pharmaceuticals. Comes with standard IBC valve of 2 inch / 50mm & a standard IBC lid of 6" / 150mm.